July data from Markit/JMMA showed manufacturing output falling at the sharpest rate in 15 months, as both new orders and new export business decreased at accelerated rates. After adjusting for seasonal factors, the headline Markit/JMMA Purchasing Managers’ Index™ (PMI™) posted 47.9 in July, down from 49.9 in June, a level indicative of a moderate deterioration in operating conditions. Moreover, the latest index reading was the lowest in 15 months. All three market groups registered a worsening of business conditions, with investment goods producers noting the steepest deterioration. 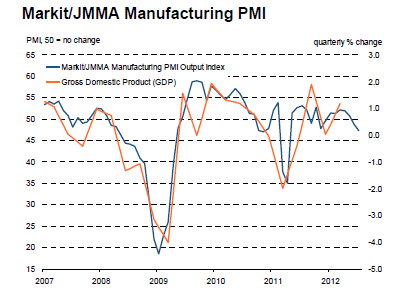 Japanese manufacturing production declined for a second successive month in July, and at an accelerated rate. The overall reduction in factory output reflected lower levels of incoming new business, according to survey respondents. The pace of reduction in new work was solid, and the steepest since April 2011. New export orders also decreased in July, for the fourth month running, with the rate of reduction the fastest in 15 months. Companies mentioned demand weakness in China, Europe and the United States. It should be very clear now that the global economy in aggregate is back in recession, yet other than my call on July 11, 2012 Case for US and Global Recession Right Here, Right Now there has been scant attention to this possibility in media reports.